King Crabs, which are also called Stone Crabs, are crab-like decapods crustaceans that are found mainly in cold seas and oceans. These sea-creatures are large and taste good. Many species of King Crabs are widely caught and sold as food. Here’s a list of weird-looking, peculiar and commercially significant species of King Crabs. Hapalogaster cavicauda is perhaps the weirdest-looking king crab species in the world. It can be found in the Pacific coast of North America. This flattened crab-like crustacean grows to a carapace width of 2 cm and is covered in hair or setae. 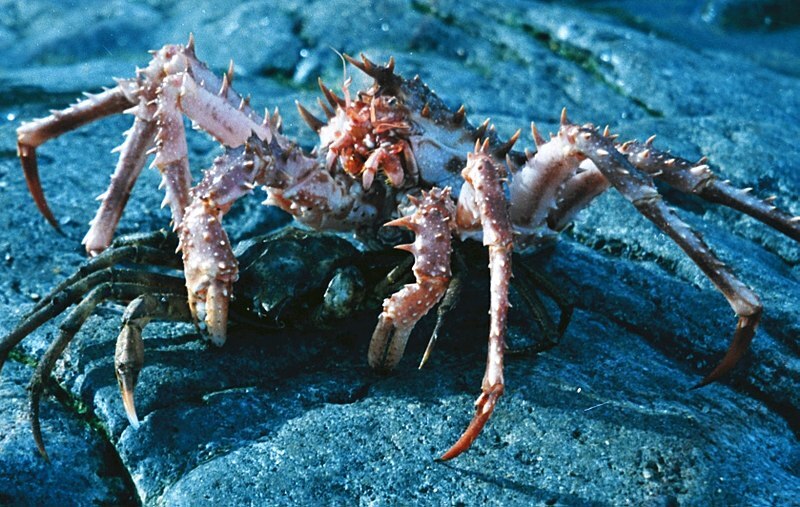 The unique-looking Umbrella Crab is endemic to the coastal regions of the northeastern Pacific Ocean from Sitka, Alaska to Point Loma, California. This crustacean that inhabits rocky areas is characterized by carapace that extends over its legs that when it pulls in its legs, it resembles a small stone. This marine creature has a half-moon shaped carapace that extends over all of its eight walking legs hence it is also commonly called Turtle Crab and Helmet Crab. The Scaled Crab is a unique king crab species that can be found in the west coast of North America. Its coloration ranges from a clouded green to reddish sometimes with banding along the legs. Ii is usually found at depths of up to 110 meters. The Blue King Crab on the above picture was photographed at Saint Petersburg Museum of Zoology, Russia. This peculiar-looking crab can be found n the several islands of Alaska, Japan and Russia. Blue King Crabs from the Pribilof Islands are the largest of all the king crabs, sometimes exceeding 8.2 kg in weight. Blue King Crabs are among the most important king crab species harvested for human consumption. Lithodes maja is a spiky or thorny king crab species that can be found in the cold waters of North America and Europe. Its carapace can reach a width of 14 cm and covered with large spikes. The Southern King Crab is another king crab species with a body completely covered with large spike. This brightly-colored crab is known as Centolla in Argentina, Chile and Peru. It can be found off the Pacific coast of South America.